First impressions do have an impact, and Rutgers University’s recent decision to more intimately meet and greet this year’s over 9,500 incoming freshmen class is making a powerful “first and lasting” impression. In previous years, the entire first year class would come to the stadium and be addressed by the president, various deans, and a welcome committee days before the start of the new school year. But that was impersonal. This new summer-long orientation with smaller groups of 500 or so gives new students the “opportunity to become familiar with campus resources and make connections with current students, faculty, and staff before beginning classes,” states Rebecca Baier, Assistant Director of the Rutgers New Student Orientation and Family Programs. Rutgers student leaders and a dedicated team of orientation leaders serve as personal guides, sharing their experiences and helping students get acclimated to their new experience as a college student. Rutgers Chabad is one of the sponsoring community partners, and offers its student leaders and participants as shining role models highlighting the many Jewish amenities Rutgers has to offer through the Chabad House on campus. Every Monday and Thursday night throughout the summer, Chabad’s campus directors, Rabbi Baruch Goodman and Rabbi Shaya Shagalow come to the Livingston Student Center with selected Chabad House student volunteers and welcome the incoming freshmen attending the orientation that day. At these resource fairs, Chabad’s rabbis together with their student leaders spotlight the many Jewish programs and parties offered by Chabad, answer any questions they have regarding Chabad’s housing and kosher meal plans, and invite the new students to all the action-packed open house events scheduled for the beginning of September. On tap this year is an Israeli Open House Celebration featuring a Shawarma and Dessert Bar, a live band, a Jewish involvement fair offering a weekly Jerusalem Café, Sushi and Soul Nights, Shabbat Committee leadership positions, a stipend Jewish discovery learning program called CLI earning students $300 per semester to investigate their Judaism, and community service opportunities, including nursing home resident and hospitalized kids visitations, and special needs teen peer leadership programs. Chabad also offers a popular Israel Advocacy Student Group #RU4ISRAEL which organizes Israel Pride Rallies, brings down Israeli governmental officials and IDF Soldiers to speak with the students, and holds an Israel Opportunities Fair each semester for travel, sightseeing and learning opportunities. Additionally, Chabad has sent over 675 Rutgers students to Israeli via Taglit’s Birthright Israel. All new students are encouraged to participate in these valuable, weekly orientation sessions. For more information regarding these sessions, visit nso.rutgers.edu or call Chabad at 732 296-1800. 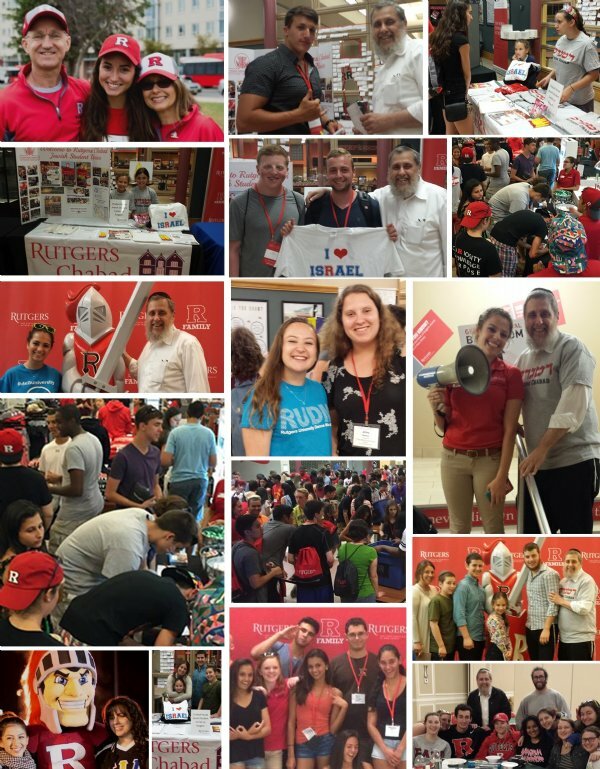 “It’s amazing to see the transformation of when so many shy, overwhelmed first year students meet us and become Rutgers Chabad family members,” explained Rutgers Junior Samantha Kolb, one of Chabad’s orientation leaders.